The initial route (M-Line, opening Fall 2018) and Lakefront Line (L-Line, opening 2020) are hopefully just the beginning for The Hop, presented by Potawatomi Hotel & Casino. These first segments are considered a starter system and have been planned as a backbone for a larger system with future expansion to other areas of the City. The proposed Fourth Street Extension is an important next step to expanding The Hop to more neighborhoods, especially Bronzeville and Walker’s Point. (See Bronzeville/Walker’s Point item below.) 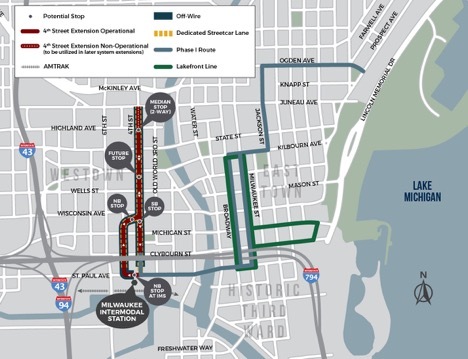 This extension will link the new Milwaukee Bucks Arena and ancillary development, and numerous destinations in the Westown neighborhood, to other parts of the streetcar line. This estimated $40 million extension includes .75 route miles, 1.17 track miles, 3 stops and one additional streetcar vehicle. The Common Council has approved the necessary $20 million local match needed for this extension which will be funded through Tax Incremental Financing. The City continues to evaluate and pursue additional funding opportunities for the remaining approximately $20 million in capital costs. This extension would provide Lower East Side residents and the Brady Street commercial district with a direct connection to downtown. The extension would continue the route north from Ogden Street along Prospect Avenue, turn west along Royall Place for one block and proceed south along Farwell Avenue before doubling back along Ogden Street. 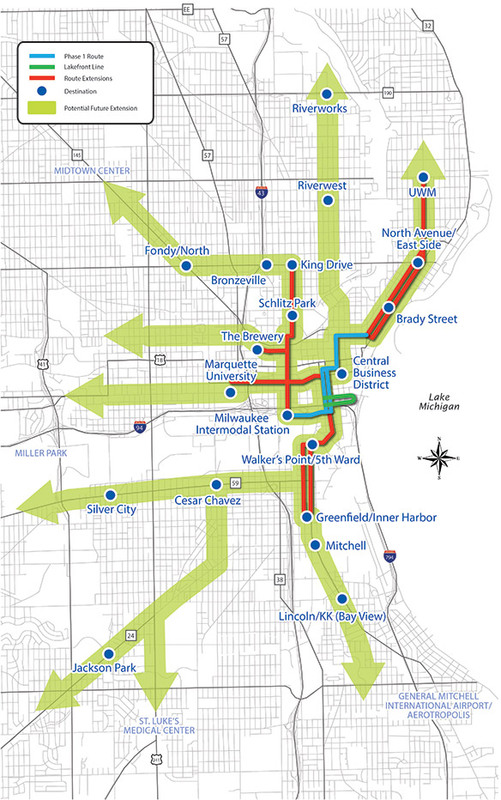 Service characteristics would be identical to the initial system; however, the additional route length would require one more streetcar. This extension has Common Council and FTA approval and the City will continue to seek capital funding opportunities. These first segments are considered a starter system and have been planned as a backbone for a larger system with future expansion to other areas of the City. The 2.5-mile M-Line and L-Line are hopefully just a start. With additional funding, more segments will be built to bring the streetcar to other neighborhoods and create a fixed-rail transit system that operates around the city. 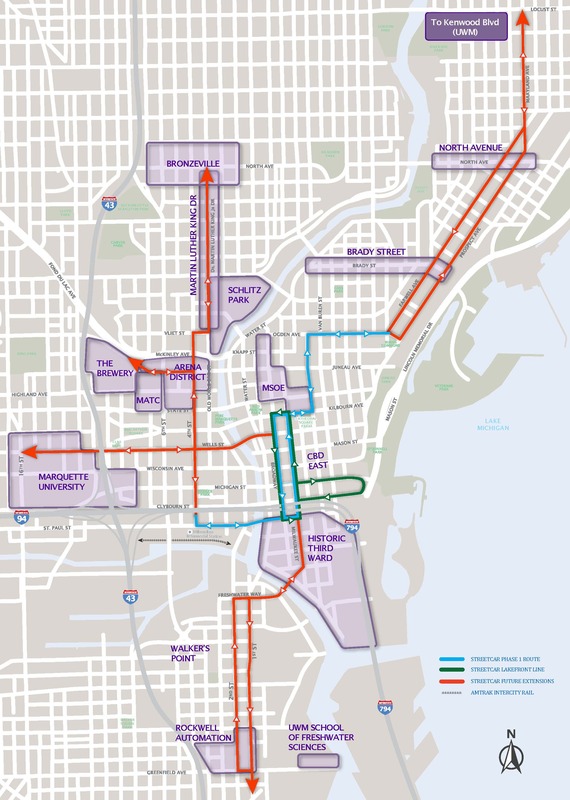 It’s not uncommon for streetcar systems in the U.S. to initially build starter routes and then expand.